New Zealand sided with Britain very quickly by declaring war on Germany on 3rd September, 1939, and early in 1940 the first troops arrived in Egypt. Subsequently they took part in the campaigns in North Africa as well as Greece, Crete, Italy and the Pacific. Though modest in numbers their troops quickly earned a formidable reputation, and were particularly highly mobile, so they saw a great deal of action and suffered proportionally high casualties. Regular visitors will be expecting a particular phrase from us over this set, so we will get it out of the way right at the start. New Zealand troops never went into combat wearing their distinctive 'lemon-squeezer' hats. The broad-brimmed hat with the pointed crown and puggaree was a national symbol, and well loved by the men, but none wore it in battle, nor even carry it with them. Nine of the 12 poses here are wearing this hat, and another man is hanging his round his neck in an awkward position, so for that reason alone most of these figures can be dismissed. This is quite a common feature found in many sets, and we are sure Strelets do not think this is accurate, so clearly this is an exercise in making these figures readily identifiable as New Zealand, when in reality their uniform was that of the British and so at this scale were indistinguishable from them. For those wishing to model a New Zealand action accurately there are already many (British) figures suitable for the task. What these figures provide is a group that can serve as New Zealand troops for those less fussed about absolute historical accuracy. From the neck down the uniform accuracy is far better. To begin with uniform was the ordinary service dress, as worn in World War I, which is what the second figure in the top row is wearing. All the rest wear the British khaki drill uniforms issued when they arrived in Egypt, so these look to be for the Mediterranean theatre rather than the Pacific. They wear shirts with sleeves rolled and long trousers with anklets and boots, all of which have been properly done. The first troops to arrive wore the old British '08 pattern webbing, which four of the poses here are wearing, though some of these also have the entrenching tool, which in fact was not issued to the men. Two other poses wear the modern type 37-pattern webbing, including (strangely) the man in the service dress, who has also erroneously been given the entrenching tool when none were issued. For the rest the webbing is hidden or hard to make out, but the three British-style helmets on show here are correctly sculpted. The officer wears a tunic, so again follows the familiar rule that officers were more smartly dressed and only used a revolver, which is a rule of this hobby but certainly not of the real events. The weaponry includes a number of rifles of course, one of which has a telescopic sight fitted (this man also has extra ammo in a bandolier). Three men are carrying Thompson submachine guns, which is correct, though here they are noticeably too large, being about one metre in length to scale, when they should be about 80cm (though they do have the correct pouches). The bottom row contains the one heavier weapon in the set, a Vickers machine gun with gunner and number two. This is entirely appropriate for the subject as this venerable weapon saw widespread use during World War II and beyond, though this is not the best model of it ever made. The tripod is very upright and narrow, and the condenser canister has been wedged up against it to make sculpting easier. The gun is very old, since its corrugated water jacket tells us it was made before 1920. However such old guns were indeed brought back during the war, so this is fine. The gunner holds the trigger with his left hand, but seems to be holding the upright top cover with his right, which is not a pose we have seen before. If the man is right-handed then you might expect him to raise the cover with his left so he could use the right for unjamming, but not here. We did wonder if the sculptor had meant this to be the sight, but if so then it is much too far forward. Whatever the story, the weapon is not currently being fired, though the number two is carefully guiding the ammunition belt into the weapon and looking at the possible targets, which is a nice and very natural pose. The poses are generally the usual fare, which is no problem. The prone man about to throw a grenade sits very poorly, such that his rifle is well off the ground, but the others are OK and we particularly liked the unusual machine gun crew. The sculpting is the usual Strelets style, with good levels of detail but sometimes exaggerated in size. There is a fairly small amount of flash and no extra plastic or separate parts, so these are ready to go straight out of the box. Such troops could have been done in battledress, or in clothing suitable for the Pacific area of operations, but the desert clothing is a good choice in our book. Certainly the hats rather destroy any accuracy claims, even though this is deliberate, but otherwise the major problems are with the entrenching tool a few of them have and with the over-sized Thompsons. 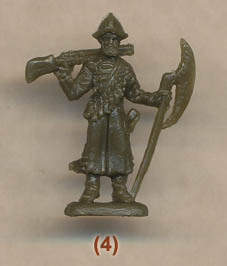 Everyone pretty much knows what they are getting in terms of Strelets style by now, and the poses are all serviceable, so if for some reason you want some instantly recognisable New Zealand troops for your battles in North Africa or Crete, for example, then this set delivers that well enough.